A digital story is essentially any combination of a spoken narrative and a number of visuals, perhaps with a soundtrack – along with new technologies to edit and share the story. Although the concept of digital storytelling is closely linked to the use of new technology, we shouldn’t forget that it is always the story and not the technology that teachers should focus on. We should merge the digital skills with the literate education; this is where teachers still have a role to play, even in the digital age. In my teaching practice I often have students practice digital storytelling to help them develop basic oral, written and digital skills, or simply content understanding.Digital Storytelling: an Efficient and Engaging Learning Activity. 15 Mar 2014 in Cyberculture, Design, Humanities, Literacy, Media, Modding, Social_Software, Technology, Writing. Yup. 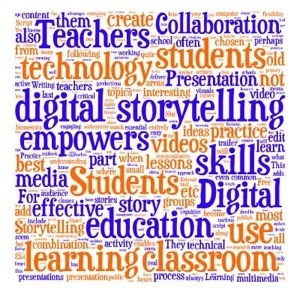 Digital storytelling is a powerful, well-established pedagogy. You know,I take that back. There are a lot of well-established practices. But we’re also adding new ones. And we’re making the tools cheaper, more accessible, and sometimes more interesting. Each time I teach a new media course I feel like I have to re-design the course, because the landscape changes so quickly. That is, of course, one of the main points I want to teach — that the ability to assess the strengths and limitations of any emerging (or established) medium is far more important than skill at using a specific tool (InDesign, for instance). I teach mostly obscure tools, specifically because I don’t want my students to think of my classes as vocational training, where I will teach you the software you’ll need to know in order to be hired. (I’ll provide opportunities for students to choose to use either a WYSIWYG editor or hand-code HTML, and opportunities for students to assess how their choices affected what they accomplished and what they learned).